Christine started working at the USGS in 2013. She is a Geologist with the Geosciences and Environmental Change Science Center (GECSC) and the Southwest Isotope Research Laboratory (SWIRL). Her specialties are geochemistry, igneous petrology, and field mapping. She is currently working on a mapping project to characterize the volcanic deposits located in the Southern Rocky Mountains (Wyoming, Colorado, New Mexico). Chan, C.F., Shea, E.K., Kent, A.J.R., Miller, R.B., Miller, J.S., and Bowring, S.A., 2017, Formation of a sheeted intrusive complex within the deep-crustal Tenpeak pluton, North Cascades, Washington: Geosphere, v. 13, no. 5, p. 1–30, doi:10.1130/GES01323.1. Chan, C.F., Tepper, J.H., Nelson, B.K., 2012, Petrology of the Grays River Volcanics, Southwest Washington—Plume-Influenced Slab Window Magmatism in the Cascadia Forearc: GSA Bulletin, v. 124, p.1324-38, doi.org/10.1130/B30576.1. Shea, E.K., Miller, J.S., Miller, R.B., Chan, C.F., Kent, A.J.R., 2017, Geochemical evidence for the development of a garnet-bearing crustal root in the Cretaceous North Cascades magmatic arc, WA: GSA Abstract With Programs 49, 6. Chan, C.F., Thompson, R.A., Zimmerer, M.J., Premo, W.R., Shroba, R.R., 2016, Insight into small-volume volcanic fields in Central Rio Grande Rift—Albuquerque Volcanoes, New Mexico: GSA Abstract With Program, 173-4. Thompson, R.A., Fridrich, C.J., Chan, C.F., Beard, L.S. 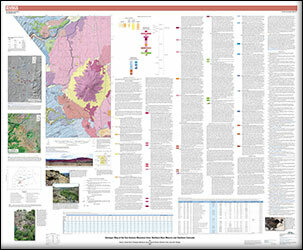 Workman, J.B., 2015, Geology of the Death Valley Junction 30’ X 60’ Quadrangle—The basis for interpreting the volcano-tectonic evolution of the Central Death Valley area: GSA Abstract With Programs 38, 10. Chan, C.F., Kent, A.J., Miller, R.B., Miller, J.S., Shea, E.K., Paterson, S.R., 2012, Construction of a sheeted magmatic complex within the lower arc crust—Insights from the Tenpeak pluton, North Cascades, Washington: EOS Trans. Abstract V33B-2864. Chan, C.F., Kent, A.J., Miller, R.B., Paterson, S.R., 2011, Magmatic evolution within the lower arc crust: Insights from crystal zoning in the Tenpeak pluton, North Cascades crystalline core, Washington: EOS Trans. Abstract V53B-2606. Chan, C.F., Tepper, J.H., Nelson, B., 2009, Geochemistry of the Late Eocene Grays River Volcanics, Southwestern Washington and Northwestern Oregon—Evidence for a Slab Window in the Cascadia Forearc: GSA Abstract With Programs 41, p. 7. Chan, C.F., Fagan, K.J., Lodwick, M.K., Ferry, D.D., Glancy, S.E., Smith, E.A., and Tepper, J.H., 2009, Petrology of the Grays River Volcanics, Southwestern Washington—Evidence for Late Eocene Rifting: GSA Abstract With Programs 41, p. 5. Chan, C.F., 2010, America’s Most Wanted Volcano: A discussion of volcanic hazards associated with Mt. Rainier: Elements—The Scientific Magazine of the University of Puget Sound, issue 7, p. 10-12. Chan, C.F., 2009, Journal of Irreproducible Results: Elements—The Scientific Magazine of the University of Puget Sound, issue 6, p. 5. Chan, C.F., 2008, Climb to Safety in Case of Jökulhlaup: Elements—The Scientific Magazine of the University of Puget Sound, issue 4, p. 24-25.